Expedia has some amazing Ammoudia travel packages Combining your bookings is a surefire way to save time and money — and get your trip off to a flying start. By securing a package deal on Expedia, you can save up to C$590*. With more than 400 partner airlines and 321,000 properties worldwide available to you on our international database, you'll have your dream vacation in no time! If you change your plans, we will honor your cancellation request on nearly all bookings with no hidden fees. Itinerary looking a little empty? Ammoudia vacation all booked but not sure what's on the cards when you arrive there? Let us assist. History is a great teacher. Step back in time for a fascinating lesson at Necromanteion. Adventurers are spoilt for choice in and around this destination. A day on the seashore is the perfect way of keeping the youngsters out of trouble. Take a couple of buckets to Valtos Beach and see who can find the most shells. Still got time to spare? Parga's Castle is an intriguing complex of historic corridors, halls and rooms. Take a look around, roam its grounds and learn a few things about this grand structure. Wind up your day of adventures with a nice comfy bed and a fluffy pillow. View the 30 accommodations in Ammoudia on offer via Expedia and choose one for your luxury getaway or cheap vacation. Visitors who delight in the finer things in life will feel perfectly at home at the Lichnos Beach Hotel & Suites (Lichnos) and the Salvator Villas & Spa Hotel (Kyperi). If you'd rather spend your precious dollars on things like thrilling adventures and wild evenings out, why not look into a few of our cheaper options? The Enjoy Lichnos Bay Village, Camping, Hotel & Apartments (1 Parga) and the Christina Studios & Apartments (Agion Anargyron 20) are a couple of recommended ones. Nobody loves spending time at the airport. But it's worth it when you remember the vacation that's waiting! Based 25 miles (40 km) southeast of Ammoudia, Aktion National Airport (PVK) is the nearest terminal. Situated in Parga, this hotel is within 9 mi (15 km) of Necromanteion, Ancient Ephyra, and Wetland of Kalodiki. Agios Giannakis beach and Lichnos Beach are also within 9 mi (15 km). 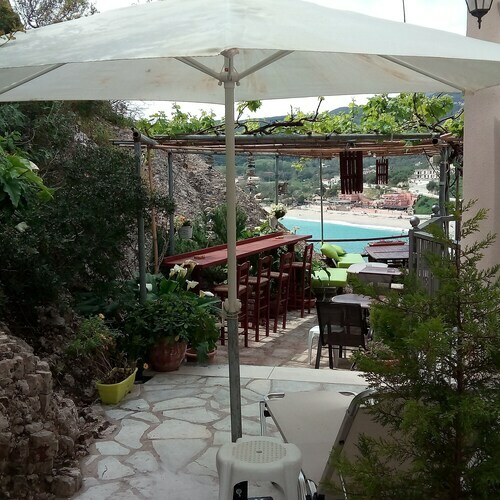 Nestled on the beach, this Parga hotel is within 1 mi (2 km) of Parga's Castle and Valtos Beach. Kryoneri Beach and Anthousa Waterfall are also within 2 mi (3 km). Situated in Souli, this hotel is within 20 mi (32 km) of Doliani Castle, Port of Igoumenitsa, and Public Library and Gallery of Igoumenitsa. Valtos Beach and Saint Panteleimon Orthodox Church are also within 25 mi (40 km). 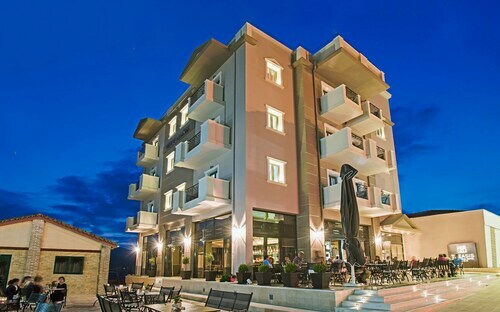 Situated in Parga, this hotel is 0.6 mi (0.9 km) from Kryoneri Beach and 1.3 mi (2.1 km) from Valtos Beach. Parga's Castle and Lichnos Beach are also within 2 mi (3 km). 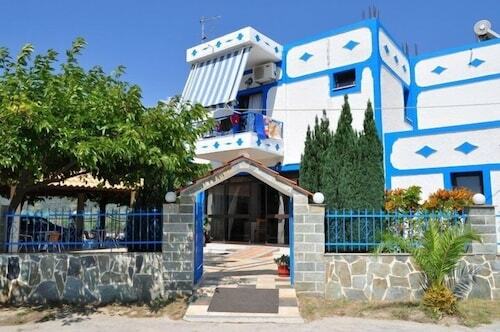 Situated in Parga, this apartment building is within a 15-minute walk of Valtos Beach and Kryoneri Beach. Lichnos Beach and Sarakiniko Beach are also within 9 mi (15 km). 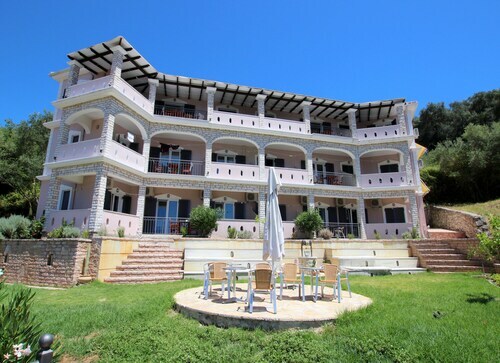 Situated in Parga, this apartment building is within 1 mi (2 km) of Parga's Castle and Valtos Beach. Kryoneri Beach and Anthousa Waterfall are also within 3 mi (5 km). Located in the heart of Parga, this romantic hotel is within 1 mi (2 km) of Kryoneri Beach and Valtos Beach. Parga's Castle and Lichnos Beach are also within 3 mi (5 km). This family-friendly Paxos hotel is within 2 mi (3 km) of Avlaki Beach and Christian Basilica of Ayia Marina. Ypapanti Church is 3.5 mi (5.7 km) away. Mon., 22 Jul. - Fri., 2 Aug. Sun., 15 Sep. - Sun., 22 Sep.
Fri., 30 Aug. - Tue., 3 Sep.